Sherabling Monastery alias Palpung Monastery is Buddhist Monastery situated near Bir in Himachal Pradesh state of India. Palpung Monastery was founded by the 8th Kenting Tai Situpa, Chokyi Jugne, in 1727. 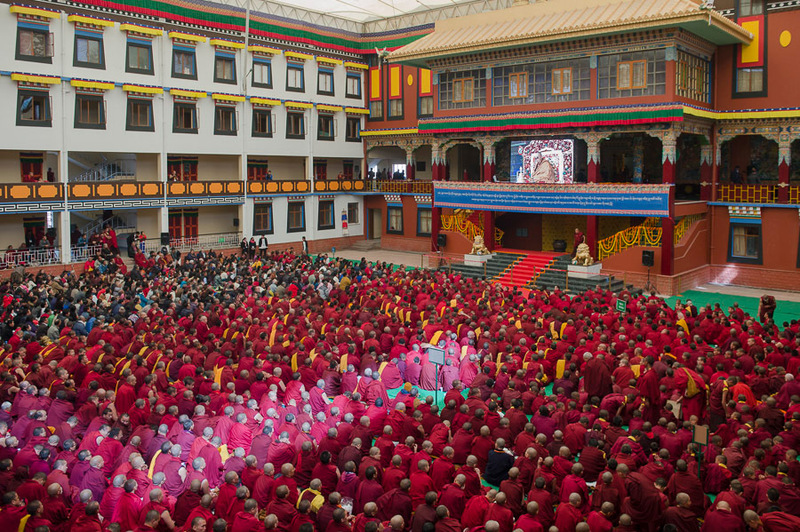 Image taken during the visit of His Holiness the Dalai Lama to Sherabling Monastery in March 2015. Image Courtesy – Central Tibetan Administration website. Palpung Monastery is the seat of study for Buddhists and a place for practice of monk-hood. Surrounded by pine forests, the monastery gives any visitor an unparalleled sense of peace. The lineage of the Kenting Tai situpas, the heads of Sherabling Monastery, is traced to Bodhisattva Maitreya, main disciple of Goutama Buddha. The Monastery is currently headed by the twelfth Kenting Tai Situpa, Pema Donyo Nyingche Wangpo. The Sherabling Monastery has one of India’s largest indoor Maitreya Buddha statue, having a height of 42 feet or 12.8 meters. The entrance of the Monastery has some of the best Thangka paintings, a form of Buddhist paintings on cotton or silk. The Monastery is also called Palpung Monastery, as it was originally established in 1727 at Palpung, a city in Tibet. The Monastery was established at its current site in 1975. Sherabling Monastery is located not far from Baijnath Temple, one of the Twelve Jyotirlingas. How Do I Go to Sherabling Monastery? Sherabling Monastery is accessible from Bir city, famous for paragliding. There are bus services from major cites of Himachal Pradesh and Also from New Delhi to Baijnath, a town at around 30 kilometers distance from Bir town. Bhimashankar Wildlife Sanctuary is a wildlife sanctuary mainly to protect Indian Giant flying Squirrels, the state animal of Maharashtra, in Pune District, Maharashtra state, India. Bhimashankar forests of the wildlife sanctuary is spread over an area of 131 square kilometers and is part of the Western Ghats, a UNESCO world heritage site. The wildlife sanctuary has 14 sacred groves or Devrais which are known for its gene pools. There are hills, waterfalls, forests, etc, in the wildlife sanctuary. The sanctuary has the ancient Bhimashankar temple. Indian Giant flying Squirrels, a threatened rodent Species in Bhimashankar Wildlife Sanctuary. Indian giant flying squirrel is a Critically threatened or Vulnerable rodent Species. They are found in to India, Sri Lanka, China, Laos, Myanmar, Vietnam, Taiwan and Thailand. Chas Kaman Dam across the Bhima river is one of the picturesque dams in India. Backwaters around the dam is ideal for your monsoon retreat. Innumerable forts like Kothaligad, Shivneri, Siddhagad, Padargad, etc, which lies around Bhimashankar wildlife sanctuary,which are ideal for trekking. Malshej ghat is known for its scenic beauty. Junnar caves are another historic place worth visiting. There is also the famous jyotirlinga temple here, believed to be originally built in 12th century CE. How Do I Go to Bhimashankar Wildlife Sanctuary? Bhimashankar Wildlife Sanctuary is at a distance of 130 kilometers from Pune, the nearest city with railway station and International airport. Mallikarjuna Swamy Temple is one of the 12 Jyotirlingas, the most sacred abodes of Lord Shiva. Mallikarjuna Swamy Temple is situated at Srisailam, in Andhra Pradesh state, India. When Lord Shiva and Parvati decided to find brides for their sons, their sons Ganesha and Kartikeya had an argument as to who is to get married first. Lord Shiva ordered that the one who goes round the world in Pradakshinam could get married first. It is Lord Ganesha who was successful in this test by going around his parents 7 times. (Going in pradakshinam round one’s parents is considered as going once round the world). Lord Karthikeya went around the world and it took longer time. Lord Kartikeya, on completion of his Pradakshinam was enraged and went away to stay alone on Mount Kravunja in the name of Kumarabrahmachari. On seeing his father Lord Shiva, coming over to pacify him, Kartikeya tried to move to another place; but Devas requested him to stay nearby. Shrishailam is the place where Lord Siva and Parvati stayed when they visited Kartikeya. It is believed that Lord Siva visits Lord Kartikeya on Amavasya day and Goddess Parvati visits her son Kartikeya on Poornima day. “Mahashivratri” is the main festival of the Mallikarjuna Swamy temple, Srisailam. There is a huge idol of Nadikeshwara in the center of the Mandapam in this temple. How Do I Go to Mallikarjuna Swamy Temple? Mallikarjuna Swamy Temple is at a distance of around 230 kilometers from Hyderabad city. Chennai and Bangalore alias Bangalooru are at a distance of 360 and 370 kilometers distance respectively from Mallikarjuna Swamy Temple at Srisailam.